Posted on November 16, 2010 October 16, 2016 , in Moffett Mounty Forklifts. 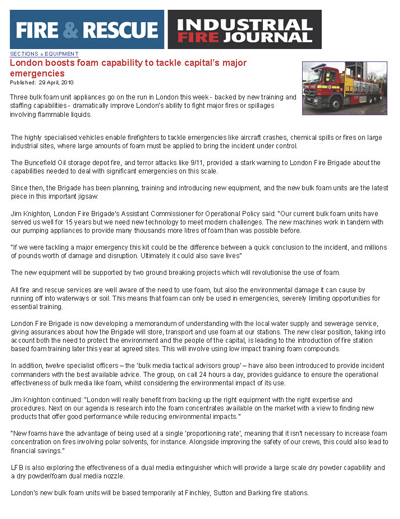 Moffett M5 truck mounted forklifts have been selected by the London Fire Brigade (LFB) to be part of their new, highly specialized bulk foam unit appliances. The new bulk foam unit is based on a 26-tonne Mercedes Actros chassis and includes a rear-mounted Moffett M5 40.3 forklift for loading and unloading the foam concentrate. The attached pictures show the entire unit and the Moffett forklift on the back. There will also be an M5 40.4 forklift going into service with the London Fire Brigade. This 4-way will be used to carry specialist equipment and material, including semi-inflatable boats enclosed in special stillages, direct to the water’s edge when required. The 4-way will enable the equipment to be delivered through narrow access points. The M5 40.3/40.4 model has a lift height of 2.2 metres, 29” tractor grip tires with “Tyre Tyte”, a ground mount, 4-way lighting, and 2 flashing beacons. For more information on the M5 line of Moffett truck mounted forklifts carried by Atlas Polar, visit Moffett M5 40.3.